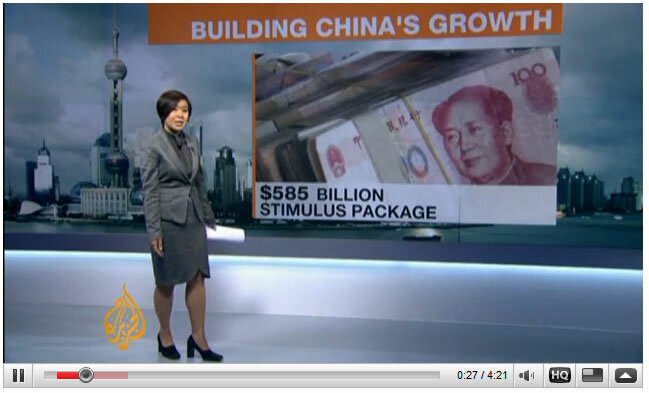 Just a fascinating video below showing how China is achieving these "consistent" GDP growth numbers [Aug 5, 2009: China's Provincial Growth Figures Far Overstated versus National Figures]. Obviously on a relative basis the country is doing far better than many in the world but trying to figure out what is actually happening inside is guesswork. Many continue to question how this growth continues, almost unabated. Part of the answers are below; keep in mind this city was obviously built well before the last round of massive loan growth [Feb 16 2009: Is China Pulling an Alan Greenspan?] We can only wonder what that historic flooding of money into the economy is currently building. 5 minutes video, you literally have to watch it to believe it. There is an existing city called Ordos, 30 km away from the new city. The new city was built from scratch just so the people from the existing city could move... mind boggling.